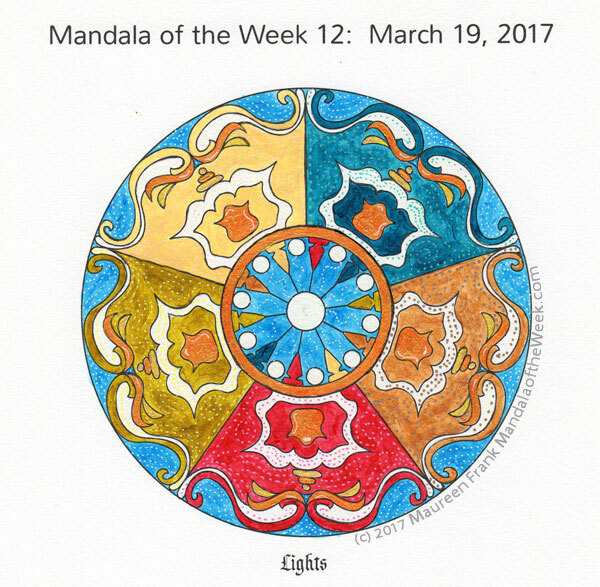 I present my coloring/painting of this week’s Mandala of the Week: Lights (from Sunday’s MotD post). Aside for the “cool” blue background, most of my colors were warmer than I normally use. It’s good to break out of the norm once in a while to explore and experiment. Overall, I’m pleased with the results. For this painting, I used M. Graham acrylics and Golden’s iridescent paint on Canson’s mixed media paper, enhanced it with uni-ball signo gel pen. In the next day or two, I’ll be posting images of my progress through this painting on my ArtProgressions.com blog site.